We eagerly wait for discounts on our favourite casual wear brands to own that one shirt or jeans which we’ve been waiting to get. What if we told you we found a lane where it’s raining discount throughout the year? You'll obviously love us more, right! So say hello to Kathriguppe Main Road which is host to a number brands from Allen Solly and Woodlands to Arrow and Basics. For those who are looking to up their Friday Dressing game, you should head to this outlet. Add to your collection of chinos in colours ranging from off white and black to olive and white. They also have an amazing winter collection of windcheater jackets at throwaway prices. Discounts go up to 60 per cent here. Woodland is a brand known for its versatile wear and its vast collection of shoes. Yup, those hiking boots and all. Currently, they have discounts upto 60 per cent on their collection. The t-shirts and polo section is also pretty impressive here, to pair with afore mentioned chinos. If affordable jean and shirts are what you're looking for, but a bit more edgy than your usual merch, hit up Basics. They have an exciting collection of denims and casual shirts (the kind your boss will love you for wearing!). Pick up your favourite pair of ripped jeans and match it with a tee or a shirt of your favourite colour or pattern (mostly checks and stripes) from here. We are eyeing the cardigans and sweaters at this Arrow factory outlet. Check out their warm woollen collection which is currently on offer with discounts upto 50 per cent. Perfect if you're planning a trip to the North or colder climes, this winter. The blazer collection will definitely catch your attention, and you have to add it to your Formal Wear Wardrobe. 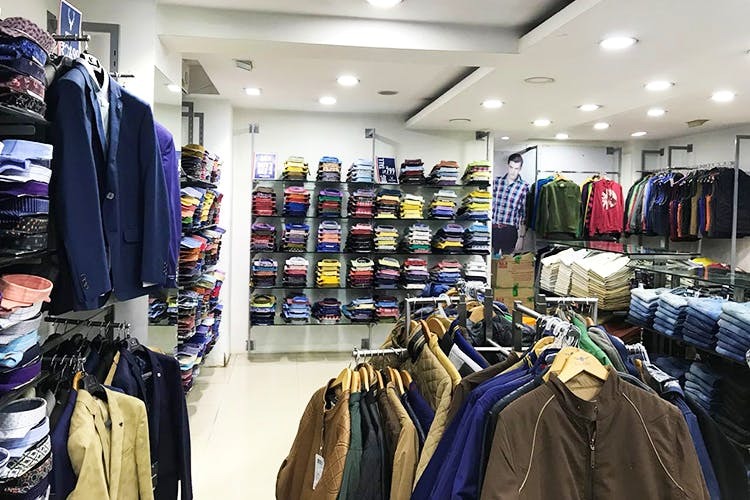 With a surprising collection of high-collared polo t-shirts, jeans and sneakers at affordable prices, the Red Tape outlet is a must visit. Their denims starts at INR 1,000, only so you know we'll probably live in jeans all year round. We found a lot of Sports outlets as well, so if you’re feeling inspired or just want to buy your favourite club jersey for the upcoming season, head to this lane right away.